While short-term volunteering has gotten a bad rap because of ill-conceived and DIY efforts, we know that a steady stream of short-term volunteers, simply put, can change lives and the world. 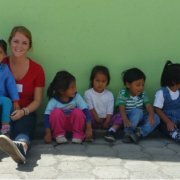 Katie, an Ecuador Global Volunteer and University of Iowa student, reflects on her short-term service trip to Quito. I was given the amazing opportunity to volunteer in a daycare center in Ecuador on a short-term service trip – for one week – with Global Volunteers. Having 50 little toddlers greet you everyday with their endless smiles and adorable voices is something I will never forget. The tías (otherwise known as the caretakers) were endlessly passionate about the children. They loved their job, which shined. Each of them tried their best to show you why they loved their job and why it was their passion. There was so much love that radiated from the daycare that is was hard not to get attached. People asked me what I thought I could really do on a short-term service trip. After I returned, I told them I helped paint so their play area was more fun. I helped give the tías an easier week. (10 little kids are hard to keep track of on your own!) I helped share what life is like in Iowa while also learning what life is like in Ecuador. I helped play. It may not sound like much, but if you saw the faces and heard the endless laughs from the daycare that week, you would be able to relate to what I’m describing. This trip gave me the chance to immerse myself into the Ecuadorian culture, something I wouldn’t have been able to get elsewhere. Maggie (our country manager), the team we were with (pictured above), and the hotel staff were all amazing. I am extremely blessed and thankful that I had the chance to do what I did… I would highly recommend a trip with Global Volunteers! Join a short-term service trip worldwide! You can join a short-term service trip with Global Volunteers in any one of our 17 host countries. We offer one- two- and three-week programs year round. If you enjoyed this post, check out: How You Make an Impact Abroad as a Short-term Volunteer.